McDonald’s,a common fast food restaurant whose menu is made up of many types of burgers and flavoured drinks. Nowadays, McDonald’s and KFC are just two of eight fast food restaurants that have conquered New Zealand. Did you know that McDonald’s was established on the 15th of April 1955. It was invented by an American Businessman Ray Kroc, who’s full name is Raymond Albert Kroc. Ray Kroc got involved with the Californian Chain McDonald’s in 1954. He then built it into a nationwide business, and eventually a global franchise. 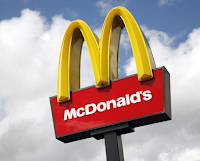 Which made it the most successful fast food corporation in the world. Unfortunately, Mr Kroc died on January 14th in 1984 but he never stopped working for McDonald’s. His legacy continues on to this day as the corporation continuously supplies customers with great tasting inexpensive food. In summary, McDonald’s, one of the most popular fast food restaurant in New Zealand was invented by a Great Successful Businessman Ray Kroc. And that is the history of McDonald’s, my dear readers.